Background: Swertia chirata, an ethnomedicinal plant, is renowned for its diverse medicinal properties. The plant produces large number of therapeutic phytochemicals responsible for remedial effect against various ailments mainly chronic fever, malaria, bronchial asthma, liver disorders, certain type of mental disorder, blood purification and diabetes. Recently reported anticancer effect of S. chirata has amplified its importance in the scientific community. Objective: The aim of this review is to deliver the pharmaceutical importance of S. chirata as diverse therapeutic agent and attract the scientific community working in the field of pharmacology to produce new drug to treat various ailments. Methodology: Data compiled and presented here were obtained from E-resources like Science Direct, Pubmed, Google, through books and web of science up to Oct 2017. Result: This review comprises the common aspects of S. chirata like pharmacologically important phytochemicals with in vitro and in vivo studies, toxicology, adulteration with similar species, dosage, conservation via in vitro studies and genetic stability with molecular markers. A bioinformatics approach to explore therapeutic targets that might suppress many diseases is also compiled to make it complete. Conclusion: The medicinal plant S. chirata is continuously being used as a traditional herb. The data indicated its safe and positive effect in the treatment of various diseases. It presents many promising prospects for modern medicine, which may be validated after the process of successful in vivo research, clinical studies, and human trials. 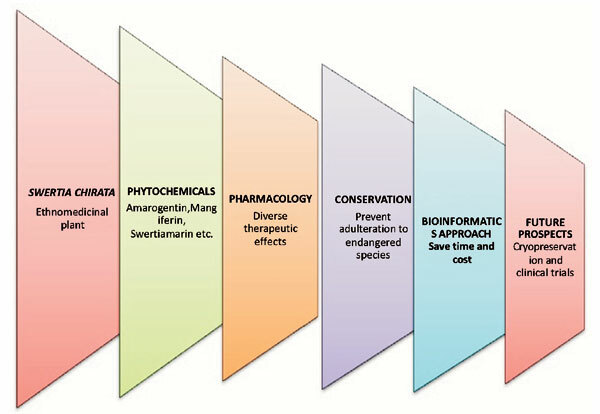 Keywords: Bioinformatics, hepatoprotective, hypoglycemic, modern drug, Swertia chirata, traditional medicine. Keywords:Bioinformatics, hepatoprotective, hypoglycemic, modern drug, Swertia chirata, traditional medicine. Abstract:Background: Swertia chirata, an ethnomedicinal plant, is renowned for its diverse medicinal properties. The plant produces large number of therapeutic phytochemicals responsible for remedial effect against various ailments mainly chronic fever, malaria, bronchial asthma, liver disorders, certain type of mental disorder, blood purification and diabetes. Recently reported anticancer effect of S. chirata has amplified its importance in the scientific community.